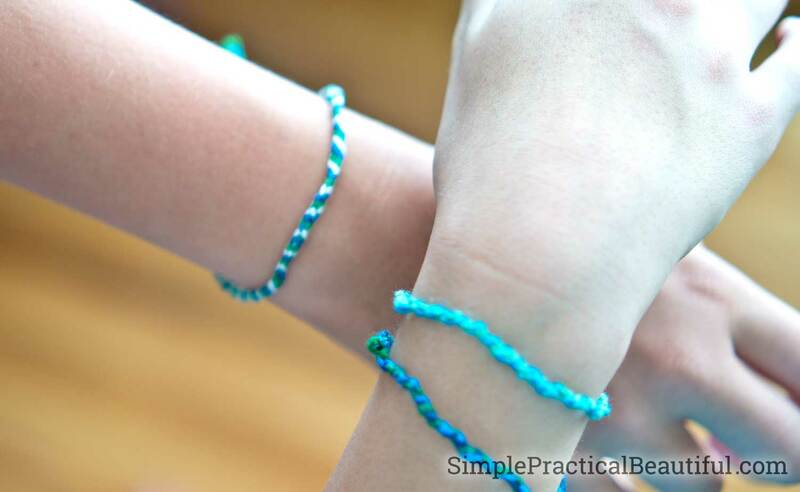 Friendship bracelets are a fun, inexpensive, and easy summer project for kids to make. They can make them to wear or make them to share with friends. 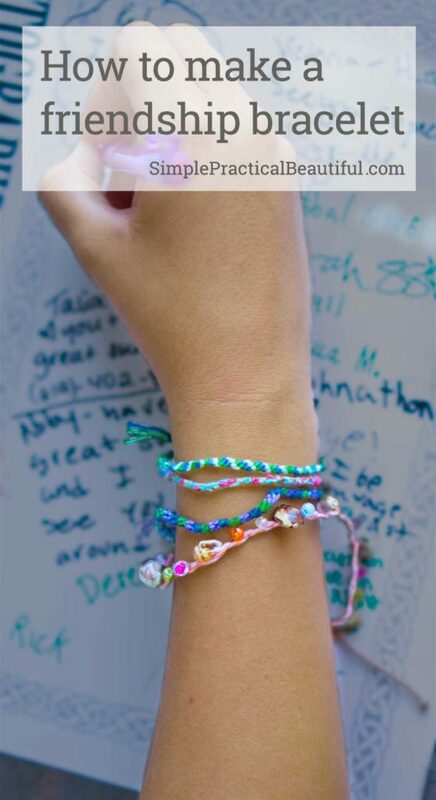 My 9 year-old daughter helped me create this post because she loves making friendship bracelets. (She’s also the one who made the pointillism art video.) She took most of the photos and helped me write the directions. These include affiliate links. For more information, read my full disclosure. 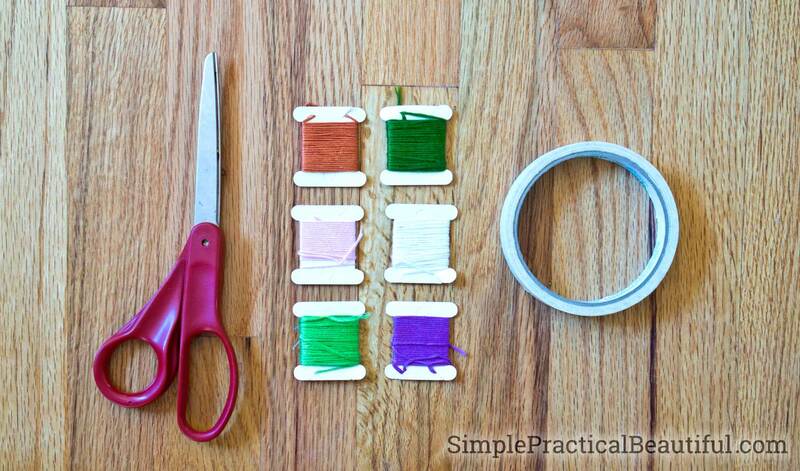 Cut the three colors of embroidery floss the same length. We found that 24 inches is a good length for making a child’s bracelet, but cut longer than you think you’ll need. It’s easier to cut off extra length later than to add more if you’re short. 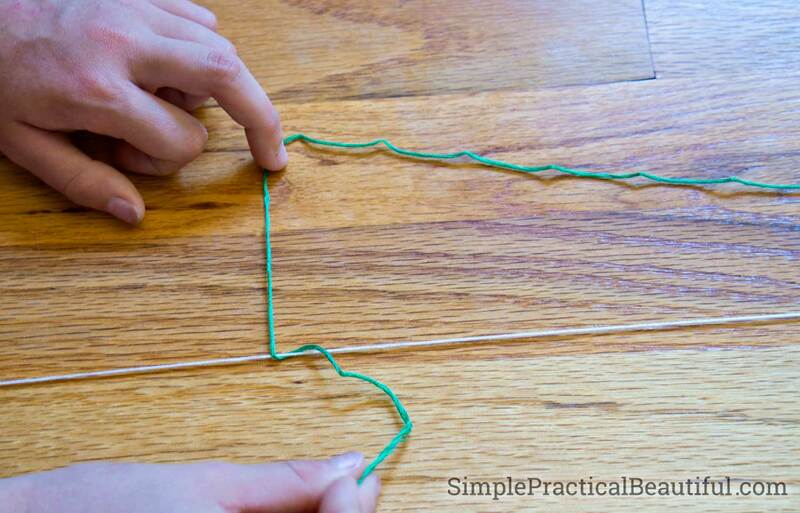 Put all three pieces of thread (embroidery floss) together, and tie a knot at one end. 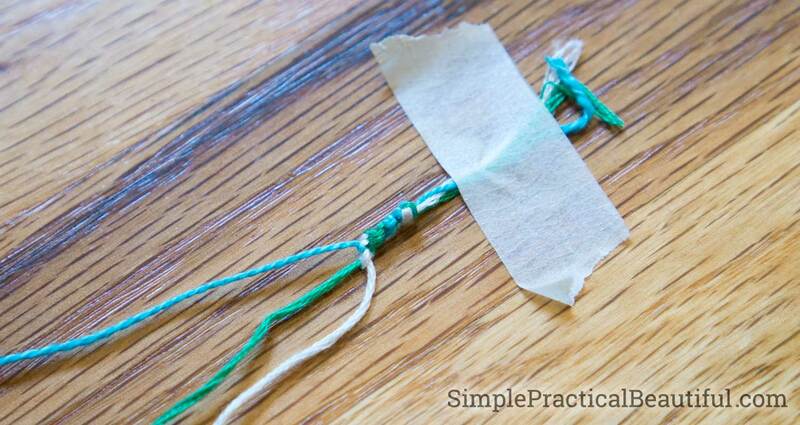 Tape the bracelet onto a sturdy surface, such as the floor or a heavy book, just above the knot. Now take the knot you just tied when you folded the thread over and carefully slide it up to the top of the thread you are holding tightly. 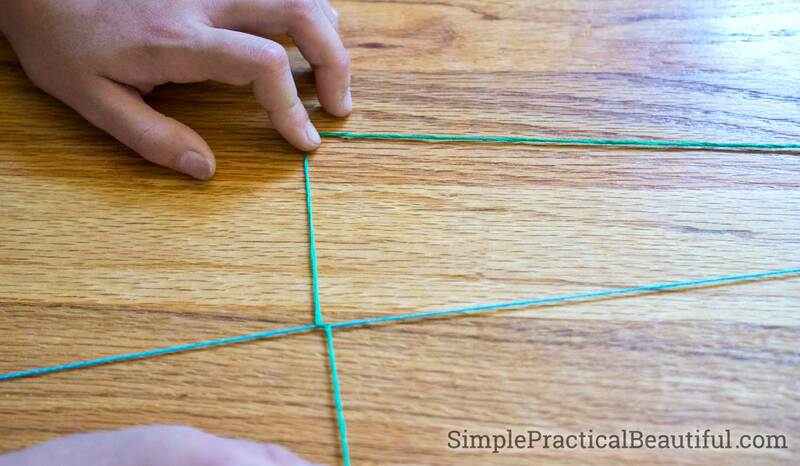 This will form a small knot at near the original knot by the tape. Then hold the thread you set aside tightly, and tie the other thread around it, so you have two knots in the same color. Just a note: if you tie the knots in the same direction, it will cause the bracelets to twist some. That’s not a problem, but if you want the bracelet to lie flat, tie the second knot the other way, so that the number 4 looks backwards. Continue the same pattern changing the threads. For example, in the pictures above the blue thread is set aside, the white thread is held tightly, and the green thread is tied around the white thread. Then the green thread is tied around the blue thread while it is held tightly, and the white thread is held tightly. This made two green knots. Next, she will set aside the green thread, hold the blue thread tightly, and tie two knots with the white thread. After that, the green thread will tie the knots. This way each of the colors shows up in the pattern of the bracelet. 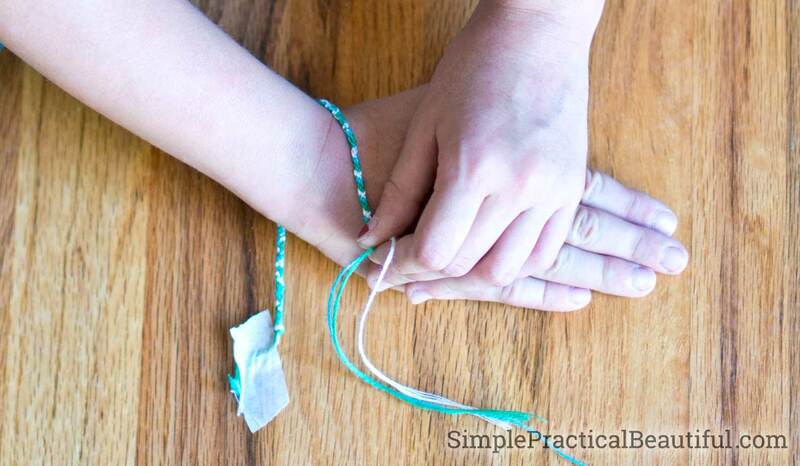 Once you’ve tied enough knots that the bracelet seems long enough, test out the length on your wrist. If it isn’t long enough, keep tying more knots. 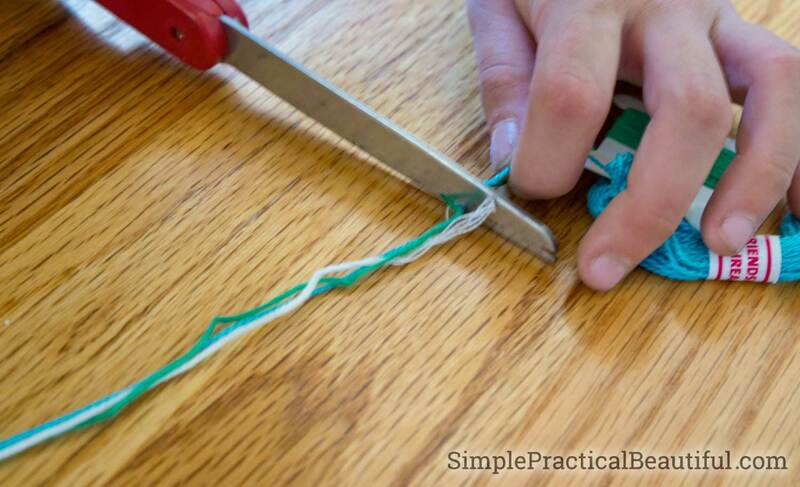 If it is, cut the threads about 2 inches below where you last tied a knot. This will give you enough room to tie the bracelet around your wrist. If you’re giving the bracelet to someone (which is why it’s called a friendship bracelet), don’t tie it together yet. Once it’s tied on someone’s wrist, it’s not supposed to come off. 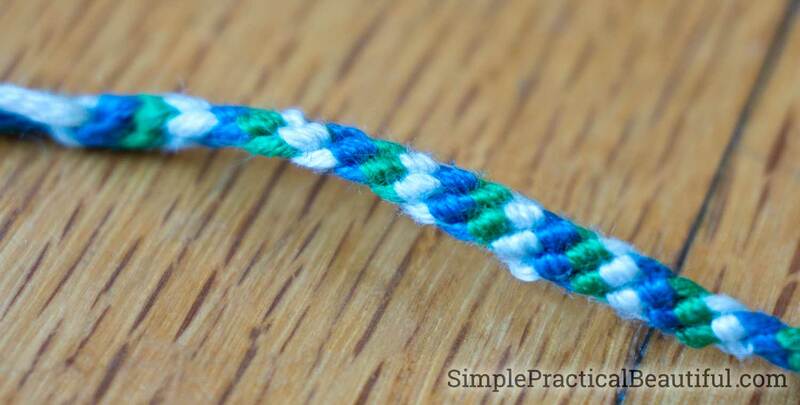 There are so many variations to this simple friendship bracelet. You can tie knots around the other two strings at the same time, like I did with Moana’s Necklace. 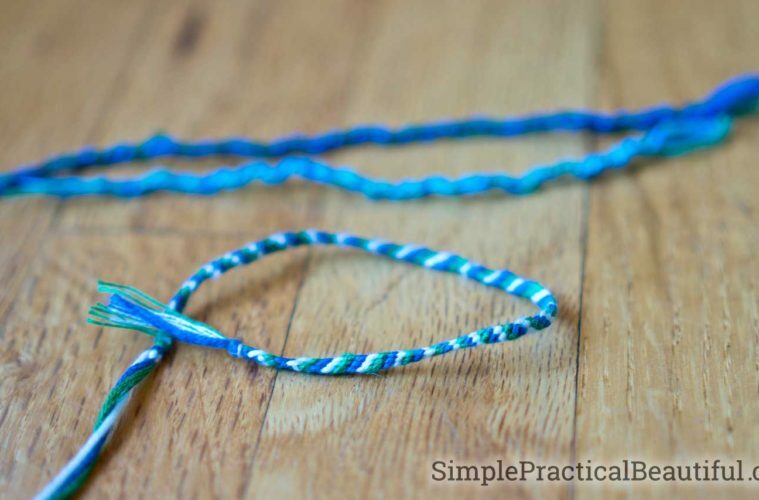 You can add more strings, and tie the same color around each string you add, making the bracelet wider and more colorful. You can even add beads to the thread between a few knots. Experiment and see what you like. One skein of embroidery floss can make a lot of bracelet, so have fun. Before you go check out all the other summer fun posts that are joining the series today. 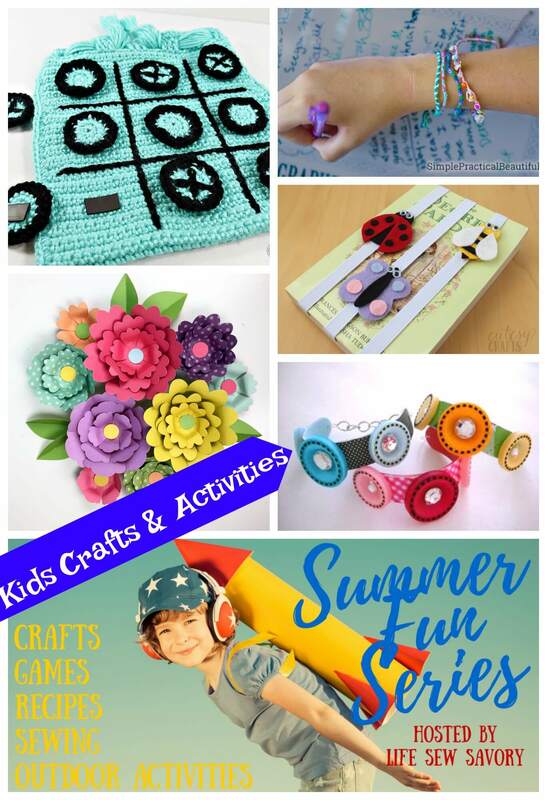 You can find lots of summer fun inspiration and ideas on Life Sew Savory. 365 Days of Crafts – Shared a cute Button Bracelet Project. Simple Practical Beautiful – Has a post about making friendship bracelets… FUN! Niki’s Homemade Crafts – Fun tic tac toe game, even good for travel! Jen Gallacher – Made gorgeous flowers. How fun to try this! Thank you, Christina. And thank you for hosting such a fun link party each week!